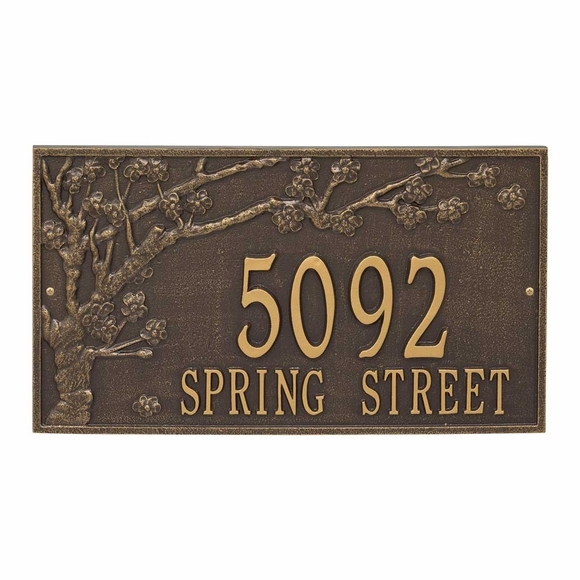 Spring Blossom 2 Line Address Plaque - - includes a beautifully detailed blossoming tree and the two-line house address that you specify. Extra large 20.25" x 11.5" personalized sign. Made in USA. Select wall mount or lawn mount (be sure to select plaque with lawn stakes). Line 1 with house number holds up to five (5) 4" numbers. Line 2 holds up to fourteen (14) 1.75" characters. It is not necessary to use both lines. If using one line only, please leave the Line 2 input box empty. Large image shown in bronze/gold. Smaller images (from left to right): antique copper, black/gold, black/silver, bronze/verdigris, and oil rubbed bronze. Dimensions (plaque only): 20.25"W x 24"H x 0.375". Dimensions (plaque with lawn stakes): 28.5"W x 24"H x 0.625". To purchase a one line version of this sign, click top link in Related Products.